Honourable MEC for Economic Development, Environmental Affairs and Tourism Lubabalo Mabuyane, Tsogo Sun Hotels chief operations officer Ravi Nadasen, Tsogo Sun’s John van Rooyen, Eastern Cape Development Corporation Board chairperson Nandipha Madiba and Eastern Cape Development Corporation chief executive officer Ndzondelelo Dlulane. The Eastern Cape provincial government, together with South Africa’s leading hotel group, Tsogo Sun Hotels today opened the 117 room Garden Court Mthatha following a massive R74 million infrastructure upgrade of the iconic 43 -year old hotel. The Garden Court Mthatha’s first upgrade since 1976 commenced in May 2018 and it came at a price tag of R74 million with the government-owned Eastern Cape Development Corporation (ECDC) contributing R63 million of the amount for improvements to the structure as the landlord. 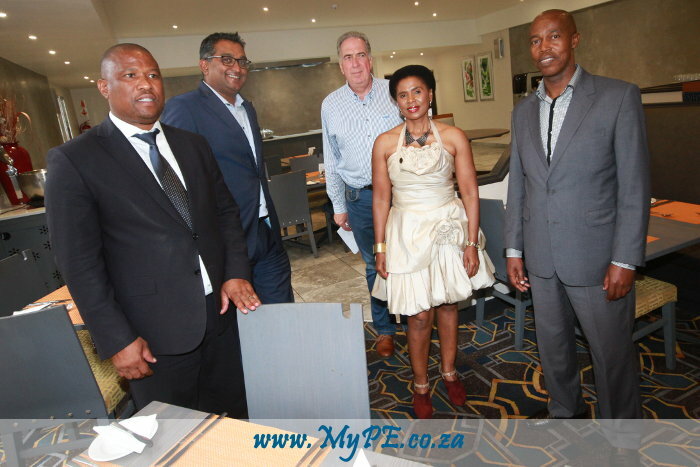 The balance of R11 million for fixtures and fittings were funded by the operating company called the Mthatha Hotel. The operating company which leases and operates the Mthatha Garden Court from ECDC is 50,05% owned by Tsogo Sun and 49,95% is owned by ECDC. The upgrade included an entire overhaul of the property which includes the restaurant, bar, lounge, and conference facility. Upgrades to the hot water generation plant, added storage for potable water, and an upgraded generator – which are all important for energy and water savings were added to the property. All the bathrooms and light fittings are the latest in energy and water saving. The water heating system has also been improved to use less energy to generate hot water. The hotel now has four suites, with one room converted to cater for people with disabilities along with an upgrade to the fitness centre. Garden Court Mthatha’s new look promises a fresh and modern experience – with the same unmatched service excellence. The upgrades have catapulted the hotel into an oasis in Mthatha, boasting unique décor with a design approach that is geared for comfort and convenience. “This upgrade will complement the sterling job done by Garden Court Mthatha staff which has helped the hotel achieve exceptional results on Tsogo Sun’s guest satisfaction index. The hotel is also ranked number one in Mthatha by TripAdvisor which is a great achievement,” says Garden Court Mthatha general manager Pranesh Sukhdeo. Tsogo Sun Hotels chief operations officer Ravi Nadasen says it is a privilege to have been involved in this total transformation of a faithful stalwart that has been in the Tsogo Sun family for 43 years. “Sincere congratulations must go to the ECDC as the owners and lessors of the building for their vision and investment in the upgrade. As co-investors, Tsogo Sun is committed to delivering on our promise to ensure memorable experiences for all our guests. Tsogo Sun has a wide footprint of hotels across the country with treasured gems in hubs of economic and tourism growth similar to this one. However, nowhere else do we have this strong partnership with a development corporation, and certainly not one as visionary and committed to the region as the Eastern Cape Development Corporation,” says Nadasen. ECDC chief executive officer Ndzondelelo Dlulane says the upgrade of Garden Court Mthatha will result in significant improvements to the customer experience, with even greater comfort and a home-away-from-home atmosphere. “I am also pleased that seven local sub-contractors were used in the upgrades and 155 local people were employed over an eight-month period in the building phase while 25 locals were employed in the demolition stage for four months,” says Dlulane. Dlulane says the improvements to the Garden Court Mthatha form part of ECDC’s property portfolio strategy of offloading non-core assets such as its standalone residential properties in order to fund its core business. A decision was taken to use the proceeds from the sale of the standalone residential stock to refurbish and improve ECDC’s commercial and industrial properties. “The strategy is starting to pay dividends as the Garden Court Mthatha refurbishment is the first project funded by this strategy of selling off standalone residential properties,” Dlulane explains. Eastern Cape MEC for Economic Development, Environmental Affairs and Tourism Lubabalo Mabuyane says the Garden Court Mthatha operates in a highly competitive industry and there is no room for complacency in the tourism industry, particularly in Mthatha where there are accommodation establishments of superior quality. “As one of the assets that fall under the property portfolio of government, we took a decision to invest R63 million to give Garden Court Mthatha a long overdue refurbishment. Our partners, who operate under the name Mthatha Hotel said they cannot fold their arms as they too realised that they will also reap the rewards of a strikingly refurbished Mthatha Garden Court, thus they added R11 million to our investment,” says Mabuyane. Mabuyane says the government locates the refurbishment of the facility within the context of growing the tourism sector in the province.